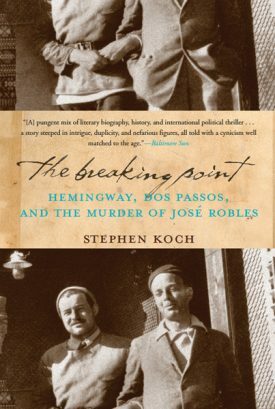 When American authors John Dos Passos and Ernest Hemingway went to Spain in 1937 to witness the Spanish Civil War firsthand, the devastation they encountered was far from impersonal: As Spain was unraveling thread by thread, so was the relationship between these two literary titans. They had arrived in Spain as comrades, leftist writers-in-arms. But a real-life literary mystery unfolded when Dos Passos’ friend José Robles—a Spanish-born Johns Hopkins professor—disappeared. Written from a novelist’s eye for detail, The Breaking Point is the story of two lives at the intersection of friendship and murder, of love and death, and of literature and history. This new edition coincides with the HBO original series “Hemingway and Gellhorn,” that has been filming since March 2011 in San Francisco. It’s due to air on HBO in May 2012, starring Nicole Kidman and Clive Owen. The film focuses mainly on the travels and relationship of Martha Gellhorn and Ernest Hemingway as detailed in The Breaking Point. STEPHEN KOCH, the former head of the Writing Division of Columbia University’s School of the Arts, is the author of numerous books including Double Lives and The Modern Library Writer’s Workshop. He lives in New York City.